Happy National Public Lands Day! Did you know that admission to all U.S. national parks is free today? National Public Lands Day is always on a Saturday in late September, and some parks hold special events. To celebrate, we would like to be sure you know about the Official Federal Recreation Lands Photo Contest, “Share the Experience.” This contest is sponsored by the National Park Foundation and FindYourPark.com/EncuentraTuParque.com. Through December 31, 2017, amateur photographers are invited to submit photos that highlight the best of America’s federal lands, national parks, and historical sites in various categories. The grand prize includes getting your image on the Annual Federal Recreational Lands Pass (2019), which is distributed to over 300,000 people annually, plus $10,000 and a bunch of camera gear. 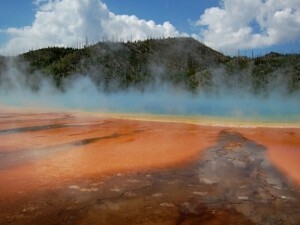 Wouldn’t it be cool to see an image from Yellowstone National park on the pass? The 2nd and 3rd prizes also include money and camera gear. You can see the winning photos from 2016 as well as more recent photos in the gallery at the Share the Experience website. That is also the place to learn about the contest rules and guidelines. Photo Credit: Janet Chapple, June 2015. You can reach Artemisia Geyser’s beautiful pool and formation in one of two ways. One is by walking beyond Riverside Geyser about half a mile up what used to be the main road and is now a rather rough trail past Morning Glory Pool (page 95 in Yellowstone Treasures) or by parking at Biscuit Basin and crossing the road to reach the other end of the trail from Morning Glory Pool. Exciting for Granite Peak Publications and me is to know that our shipment of several pallets of spanking new copies of Through Early Yellowstone arrives today at the Port of Seattle from China! That’s the unseen news. 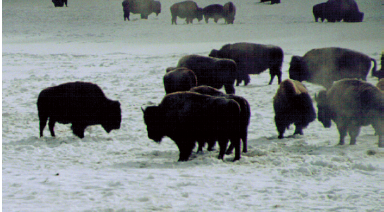 The fun-to-see news appeared this morning in the Yellowstone Foundation newsletter. It’s the announcement of the winners in their Yellowstone Forever Photo Contest.View a slide show of the 100 top entries.Their 2016 contest will open in June. 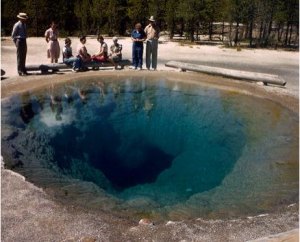 Continuing the occasional posts about my favorite hot springs and pools in Yellowstone, today I’ll feature two located in Upper Geyser Basin. 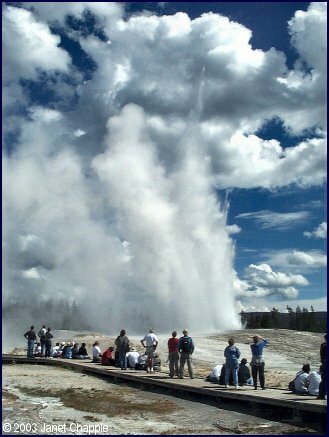 One of these is a short walk from Old Faithful Geyser and next to the remarkable formation of Castle Geyser. The other takes more effort to reach but is also worth every bit of it. Crested Pool, pictured by my friend Suzanne Cane on a beautiful sunny day a couple of summers ago, has gone by many names since first seen by writers about the park. It has stayed consistently beautiful since it was first described in the 1870s—not true of all Yellowstone’s hot pools. 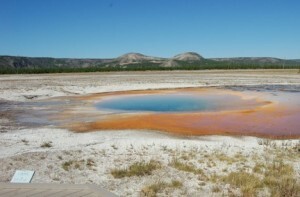 We’ve used Suzanne’s picture on the cover of our guide to the park’s most accessible thermal areas, Visiting Geyserland. Lee Whittlesey, Park Historian, lists no fewer than ten names for this pool in his Yellowstone Place Names. 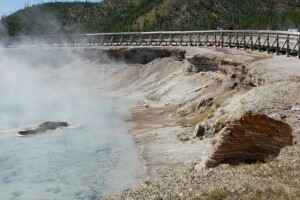 First it was called “Fire Basin” by expedition leader Ferdinand V. Hayden (1872). Then the goddess Diana was featured in three names as “Diana’s Spring,” “Diana’s Well,” and “Diana’s Bath.” Sadly, the most appropriate old name was “Devil’s Well”: in 1970 a young boy jumped or fell to his death in this pool. just for its gorgeous-colored pool and the unusual patterns of its geyserite surroundings. You can continue on the path past other lovely features all the way to Biscuit Basin. 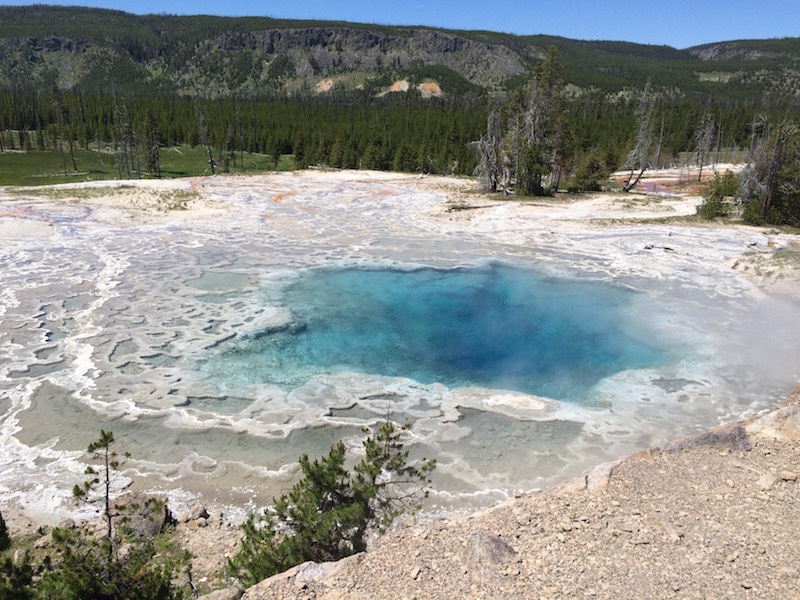 It’s high time I featured the hot springs of the must-not-miss geyser basin called Midway. 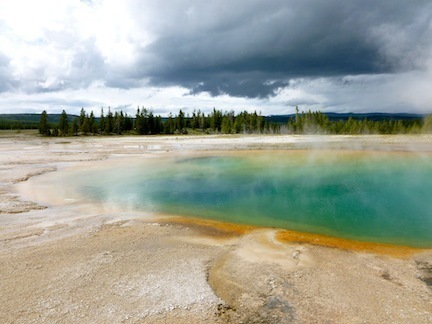 A short distance north of Upper Geyser Basin—where Old Faithful Geyser is located—and a similar drive from the capacious Lower Geyser Basin, is an area that was called Hell’s Half-Acre back when the park was new. 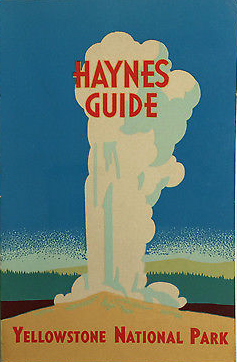 Those were the days when the hot wonders of Yellowstone seemed to put travelers frequently in mind of hell and the devil. Today’s visitors climb the boardwalk (accessible with assistance) up from the Firehole River to a remarkable caldron of steaming sky-blue water below a deep opening in the buildup of countless layers of geyserite rock deposited over the centuries. Our pictures show a small part of Excelsior Geyser’s edge as it looks today (first photo) and an eruption in 1888 (second, black-and-white photo), almost the only decade when this tremendous geyser is known to have erupted—as high and wide as 300 feet (90-plus meters). Two small but lovely pools appear along the boardwalk as you leave Excelsior’s edge: well-named Turquoise Pool (first) and sometime-geyser Opal Pool (second), which is inclined to drain completely at times. The final attraction you will pass, Grand Prismatic Spring, by itself takes up almost two acres of space, giving the lie to the old popular name for this whole basin. Not only its size but its coloring is incomparable. 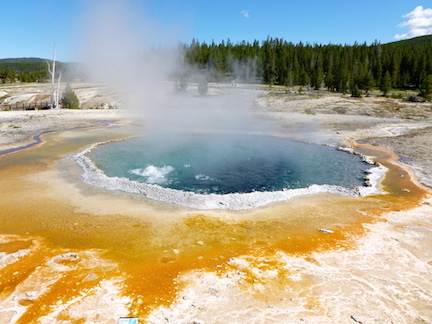 Yellow, orange, and brown bacterial mats encircle the central pool’s blue and green, and prodigious runoff creates gentle brown terraces leading away from the pool. On a sunny summer day, the blue of the water reflects delightfully in the pool’s steam. Our picture was taken as we walked along the edge, but a quick look at Google Images will show you numerous shots of the whole pool taken from the air and from the hills to the west and east of the basin. When you’ve seen Grand Prismatic Spring you will understand the dismay caused by a German tourist crashing his drone into this irreplaceable Yellowstone treasure during the summer of 2014. His careless act (and others like it) led to a total ban on drones in all national parks. Visiting Midway Geyser Basin provides an experience like none other in the world. 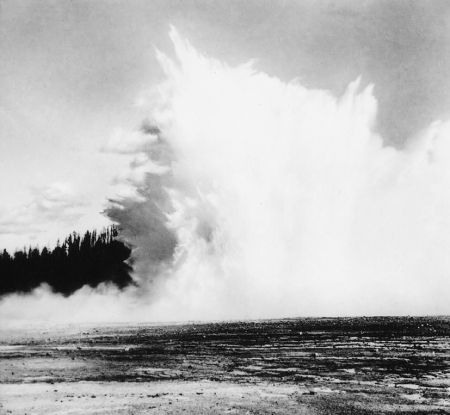 The historic picture of Excelsior Geyser erupting, which you can also see on page 64 of Yellowstone Treasures, was taken in 1888 by Frank J. Haynes (courtesy of National Park Service, Yellowstone); Excelsior’s edge, Grand Prismatic Spring, and Opal Pool (in 2010) by Bruno Giletti; and Turquoise Pool by Suzanne Cane.